Download and Install java 7 from http://www.oracle.com/technetwork/java/javase/downloads/jdk7-downloads-1880260.html . Accept License Agreement. Install from zip file. To install eclipse, unzip eclipse-jee-luna-SR2-win32-x86_64.zip in d:\eclipse. 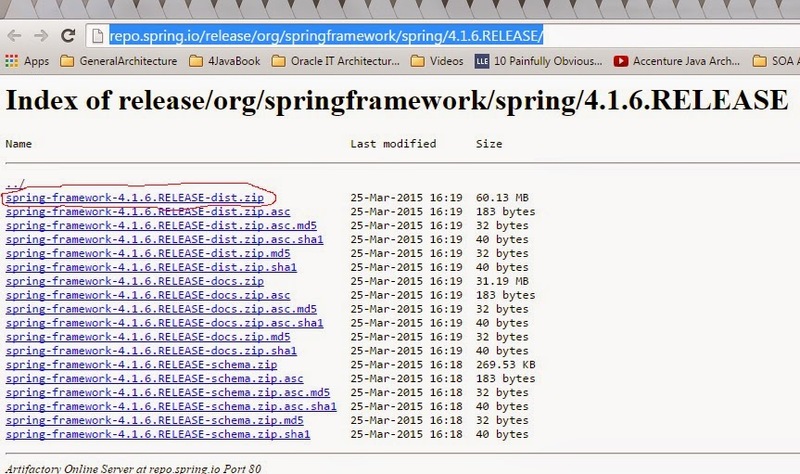 Download spring-framework-4.1.6RELEASE-dist.zip file. Unzip this file in d:\spring folder. Download Apache Commons Logging commons-logging-1.2-bin.zip. Unzip commons-logging-1.2-bin.zip to d:\ commons-logging-1.2 folder. 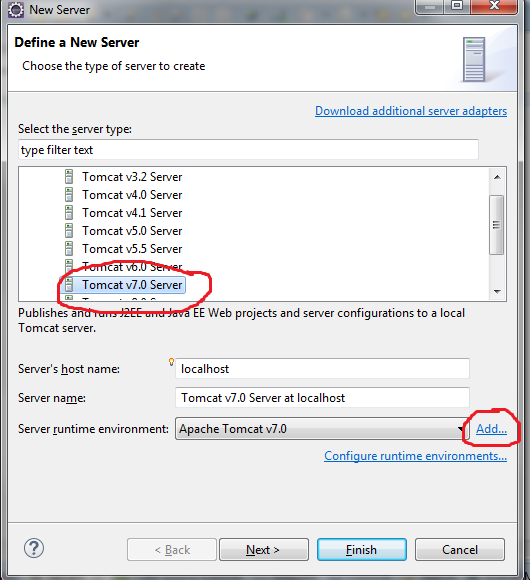 Download Apache Tomcat Web Application Server from http://tomcat.apache.org/download-70.cgi . You will get apache-tomcat-7.0.61-windows-x64.zip file. Unzip apache-tomcat-7.0.61-windows-x64.zip to d:\ apache-tomcat-7.0.61. 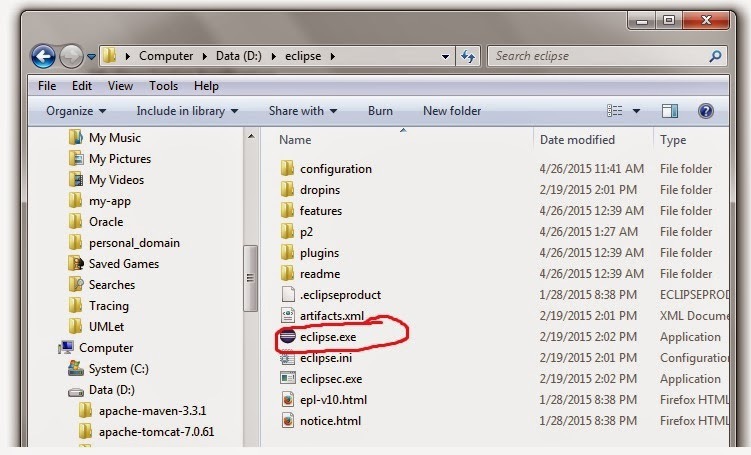 Start eclipse by double clicking eclipse.exe. You can give a new name for the workspace you want to use for your Spring applications. 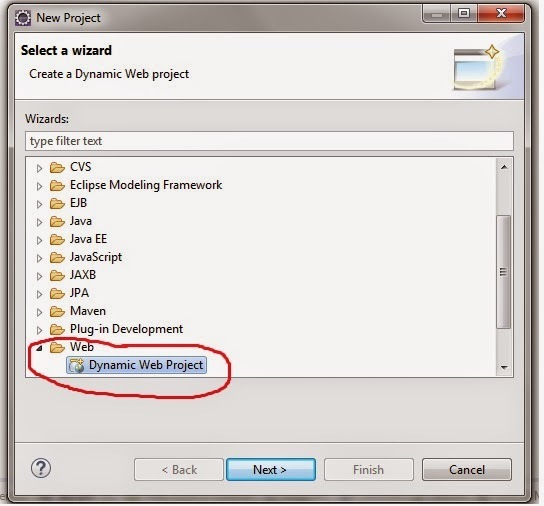 Create a new Java project in eclipse Luna IDE. 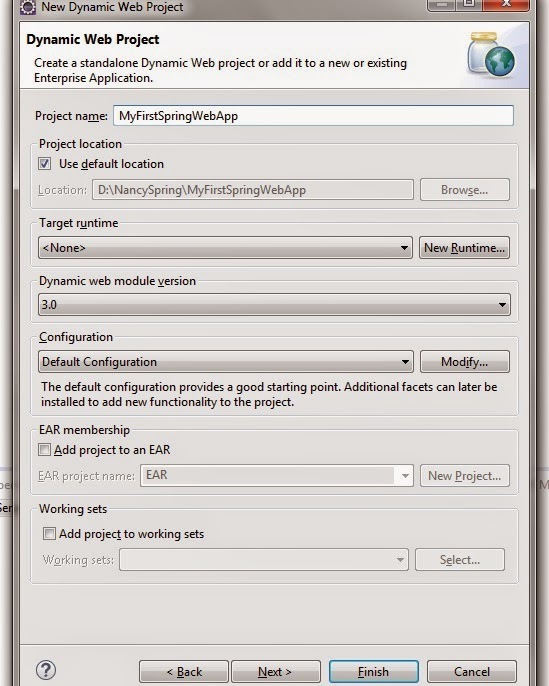 Click Next and give the project name as MyFirstSpringWebApp. Click next and next. 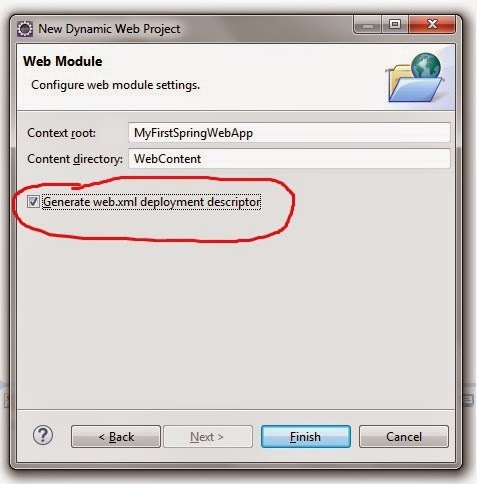 At this point select Generate web.xml deployment descriptor. 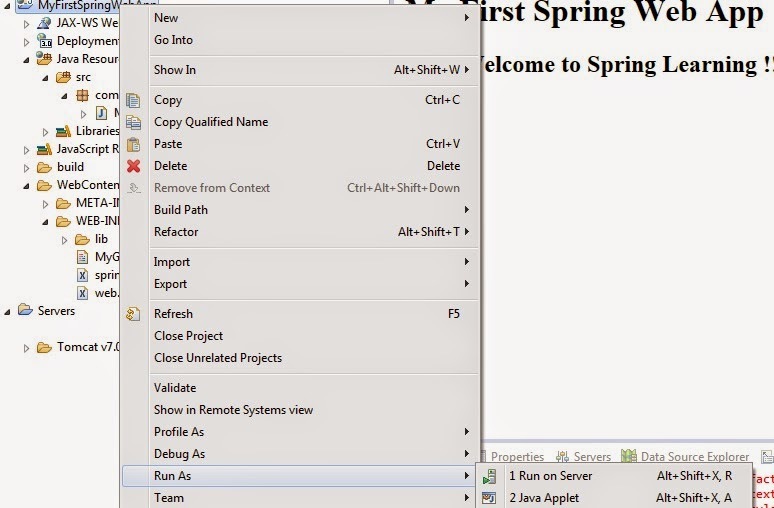 Prepare your project to be spring web application. You need to add spring libraries to your web project. 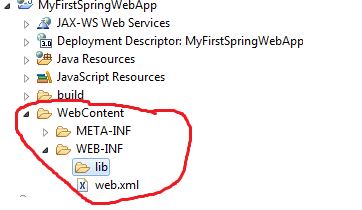 Select lib folder in WEB-INF folder in webContent in your Web Application project. Open d:\spring ( this is the folder where you have unzipped spring jars). Go to the lib folder, you will see all the jars. 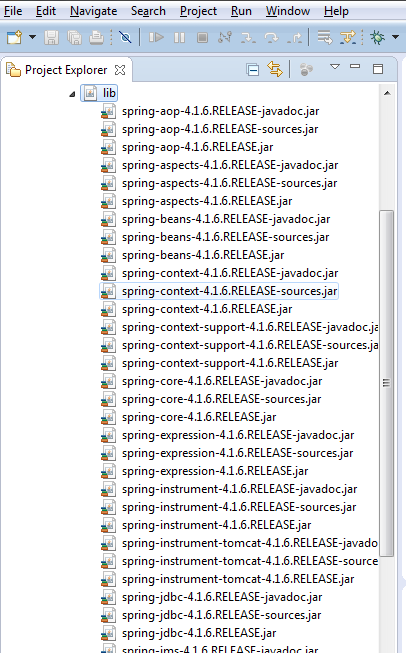 Select all the jars and copy (ctrl+A and CTRL+C), and then go to eclipse project and paste all these jars in lib folder. You need to add Common logging lib too. To do this go to D:\commons-logging-1.2 and copy commons-logging-1.2.jar. and paste this jar to WEB-INF\lib in your project. 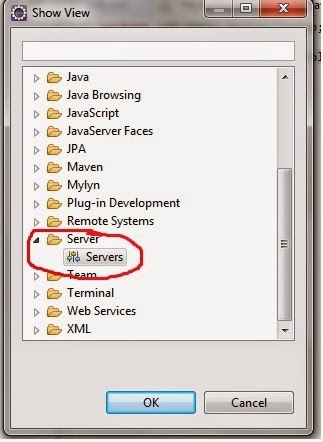 Step – 9 You need to add Application Server to your application. 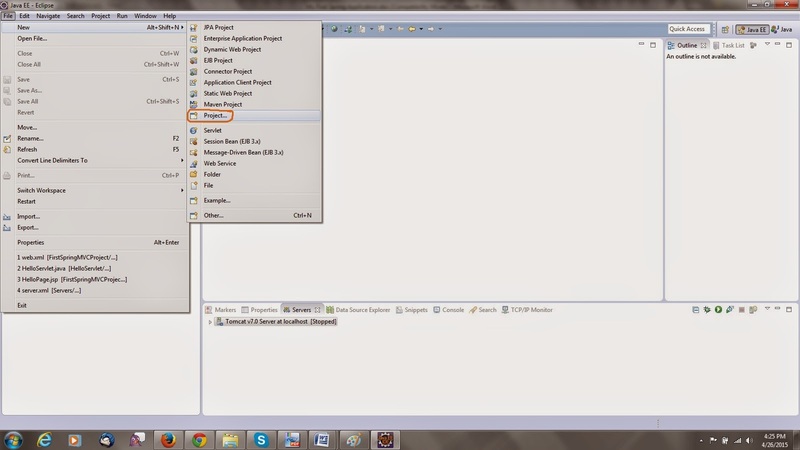 In eclipse IDE, select window ->showview ->others. SelectServer-> servers. Click on this link to add Server. 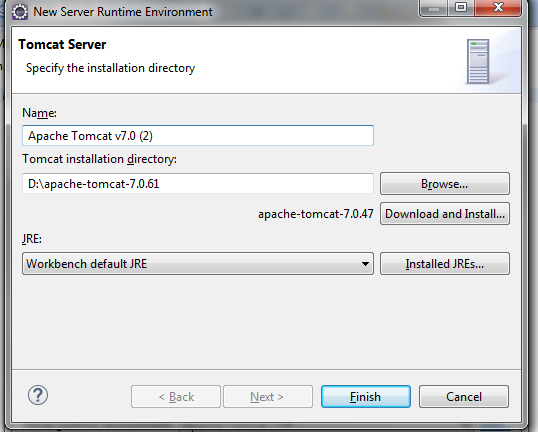 Select Apache Tomcat 7. Click on Add link. Give the path where you have unzipped the Tomcat Apapche 7 server. Right click your project and select properties. Select Target Runtime as Apache Tomcat 7. 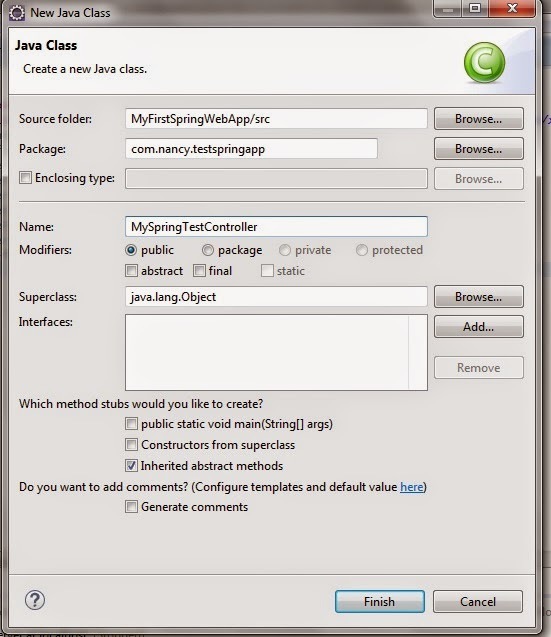 Create a class MySpringTestController in package com.nancy.testspringapp. 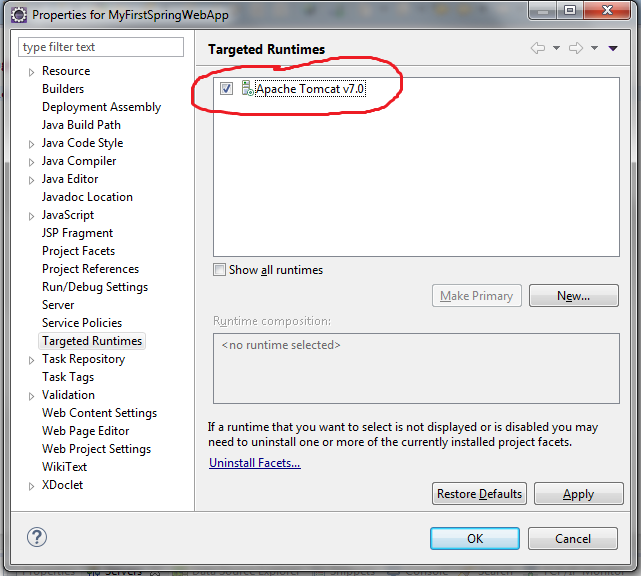 Add a new jsp page and name it MyGreetingsPage.jsp in WEB-INF and add the following code. You are ready to run your first Spring web application. Right click the project and Run As -> Run on Server.